Is it just us or has back-to-school season become unnecessarily commercialized? 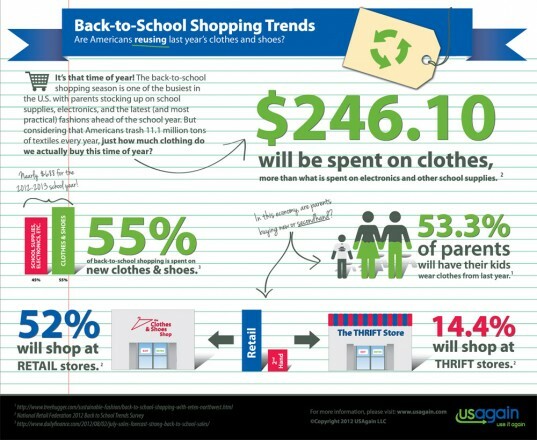 American parents are spending an average of $246.10 on clothes and $129.20 on shoes per K-12 child this school year, according to a recent survey from the National Retail Federation. That’s more than what they’re ponying up for electronics ($217.88) and school supplies ($95.44) such as notebooks, pens, and backpacks. But although the fall season is the second biggest consumer-spending event for retailers behind the winter holidays, the strung-out economy has changed the way people are shopping. Nearly six in 10 respondents (59.9 percent) said they’ll take advantage of department stores’ private-label product lines, up from 57 percent in 2011 and the highest in the survey’s 10-year history. Nearly four in 10 (39.6 percent) will be buying their gear online, up from 31.7 percent last year and nearly double the number who did so in 2007. How does your family stack up against the rest? Click below the fold for USAgain’s handy infographic to find out. Gotta say that kids outgrown and ruin things unlike adults. They're messy, generally more active, and are growing taller. They often need new things. Thrift store shopping can be (depends on many things) a huge burden for kids that actually hate shopping or who have some behavioral issues which make short shopping times essential, if possible. My daughter ended up with a lot of new clothing and supplies, both of which are increasingly pricey. If I had many alternative choices, I would have used them. She is wearing lots from last year, but lots of things don't fit or are simply worn out. We donate everything we can which have been outgrown, etc. I would like to see the face of retail shopping change for a more local, environmentally friendly, and fair-trade/labor practices way, but we have a lonnnng, lonng way to go. I suspect that it will take grass-roots community efforts as public opinion/trend has to be changed to make it work. In the meantime, I have been setting up a sewing room and hope to put it to good use soon.